Big Bend Tunnel is a decommissioned tunnel on the mainline of the CSX Corporation’s rail line through southern West Virginia west of Talcott, West Virginia. According to legend, folk hero John Henry was killed in a contest with a steam-drill during construction of the tunnel through Big Bend Mountain. Big Bend Tunnel is located near Talcott approximately 10 miles east of Hinton, West Virginia. Its construction was one of the largest projects undertaken by the Chesapeake & Ohio Railway (C&O) as it extended its railroad through southern West Virginia. When completed, it was the longest tunnel on the line. “Big Bend” is a name for a section of the Greenbrier River where the river literally makes a big bend around Big Bend Mountain. The distance around this w-shaped bend is about a eight miles. Surveyors chose to avoid the bend by building the tunnel through the mountain. Construction of a tunnel of more than a mile-and-a-quarter in length was quite an undertaking, considering the technology available in the 1870s. Crews discovered that the mountain’s hard, faulted shale resisted drilling and blasting. Exposed to air, it would grow brittle and crumble. Resultant rock falls killed many workers and mules used for haulage. More than 22 millions pounds of rock dropped in one huge fall near the east end of the tunnel. The construction of the tunnel was begun in 1870. The Border Watchman of June 6, 1872, reported that crews broke through the mountain on May 31. The first train passed through the tunnel later that year, though it was not until 1873 that work was completed. The first freight train passed through the tunnel in February 1863. Though lined with timbers, rock falls continued to plague the tunnel for many years. In the early 1870s an entire train crew was killed by a massive fall. The C&O thereafter began to line the tunnel with brick, an undertaking that required 10 years and more than six million bricks. 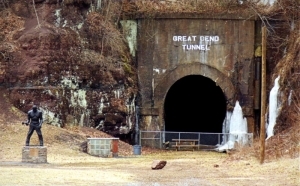 The Great Bend Tunnel was later opened alongside the Big Bend Tunnel. The tunnel is featured in the Fallout 76 video game and in other popular culture references. Interior of Big Bend Tunnel. Photo courtesy Levi Moore. While the tunnel was being lined with brick, many workers claimed to have seen or heard the ghost of John Henry inside Big Bend Tunnel, and to this day rumors about the ghost continue to circulate. 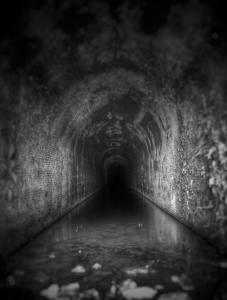 Early residents of Talcott were said to have seen and heard the ghost in and near the tunnel soon after its completion. By some accounts, the ring of Henry’s hammer striking steel could be heard from within. Others reported that apparitions of the steel-driver appeared just inside the eastern portal. The ghost was often reported to wield two hammers, swinging them alternately as if driving steel. As late as 1883, the railroad was reported to have had difficulty recruiting local workers to line the tunnel with brick. Repairs stopped repeatedly after workers thought they heard the sound of the hammer or when sightings of Henry’s ghost were reported. “Alfred Owens, a lifelong resident of the area, was a brick mason on the crew hired to line the Big Bend Tunnel with brick. One afternoon, while working alone in one section of the tunnel to finish one section of the brickwork, Owens heard a noise. At first he paid no attention to it, thinking the sound came from a rock falling or perhaps a rat scurrying through the tunnel. Owens went back to his work, giving the no further regard to the sound. But within a few moments, the sound started again. This time the noise Owens heard was series of steady clanging sounds, sounding much like steel being tapped.